We’d love your help. Let us know what’s wrong with this preview of Eats More, Shoots & Leaves by Lynne Truss. A pocket-sized paperback compendium of the hilariously illustrated #1 New York Times bestselling series of books about punctuation. 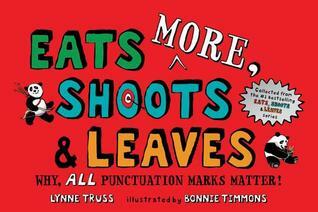 Lynne Truss and Bonnie Timmons's hilariously re-imagined children's adaptation of Eats, Shoots & Leaves was a wild success when it came out in 2006, spending five weeks at #1 on the New York Times bestseller list. The Girl's Like Spaghetti A pocket-sized paperback compendium of the hilariously illustrated #1 New York Times bestselling series of books about punctuation. To ask other readers questions about Eats More, Shoots & Leaves, please sign up. The book is simple and easy to use. Throughout most of the book, each page consists of two pictures, each captioned with a sentence that describes said picture. The captioning sentences consist of the same words in the same order, but This children’s book shows kids what can go awry for want of properly placed punctuation. Lynne Truss’s popular and humorous grammar guide has spun off a cottage industry of books designed to shift perception of grammar studies from brutally dull to witty and fun.